There are many things we need to do to allow our body to be healthy naturally without drugs and surgery. You can read the first of this series of blog posts by clicking here: Freehold Chiropractor Shares Health Myths and how you can be Healthy Naturally without Drugs or Surger. In my chiropractic office in Freehold, NJ, I discuss the 5 tenets to health and wellness: Sleep, mental well being with limited stress, proper nutrition, exercise and most importantly an optimally functioning nervous system. Today we are going to discuss how sleep is important to overall health. We spend about 33% of our life sleeping! That’s a lot of time and if we “do it right”, our sleep will restore and rejuvenate us like clockwork. I’ve created a little quiz for you on your sleep habits. To take the quiz, simply check off your answers, and when finished, simply count the number of true and false answers. ___ ___ 1. My mattress has lumps and bumps in it; it’s not firm. ___ ___ 2. My mattress sags. ___ ___ 3. I sleep on my stomach: it’s one of the most comfortable ways to sleep. ___ ___ 4. I like to sleep with no pillow at all. ___ ___ 5. I like to pile up the pillows and sometimes (or often) sleep with more than one pillow underneath my head. ___ ___ 6. When I sleep, my head is dropped forward, with my chin towards my chest. ___ ___ 7. I don’t use a feather pillow. ___ ___ 8. I love to read in bed, and can prop myself up on my elbows to do so. ___ ___ 9. I use a regular foam pillow. ___ ___ 10. Sometimes I rest on the couch with my head propped up on the arm rest. ___ ___ 11. Sometimes I rest on the couch with a pillow and notice that I have to look up at the television set to do so. Now total up the number of “true” statements you have. The lower your number of “true” statements, the better your sleeping score. How did you do? Let me explain how to sleep because there’s more to it than just plopping yourself into the bed and covering up with blankets. There are good sleep habits and bad sleep habits just like there is good cholesterol (HDL) and bad cholesterol (LDL). It’s possible to have bad sleep habits for years without bad consequences. The problem with bad sleep habits is that you could be wearing down the joints in your neck. The constant wearing down of the joints is risky because once there’s a trauma to the neck; those joints “give out.” In chiropractic, we call this degenerative joint disease. Why Take a Risk When Bad Habits are Easily Changed? The good news is that simply by changing some bad habits, you can stop any joint damage from occurring in the future. The more we can build up your nutrition, the greater chance we have of reversing that damage. 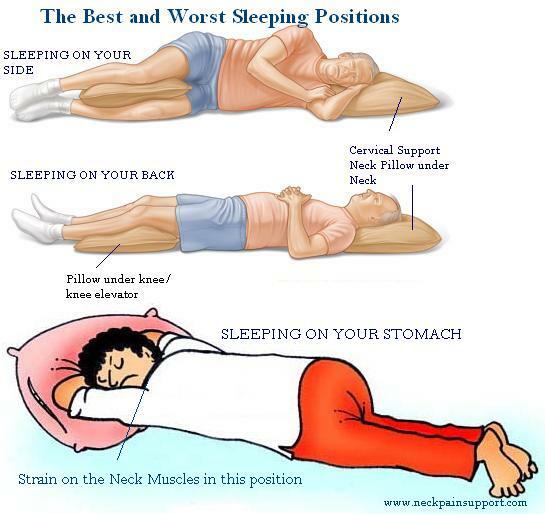 Sleeping on your stomach is a bad habit because it forces your neck in one position – to the side – for long periods of time. While your neck is turned to the right or left, several of the muscles (and joints) in your neck are working hard to keep your head in that position. Other muscles are working hard to balance the positioning muscles. Neck muscles that are tight for several hours can cause pain, inflammation, numbness and tingling and headaches. It’s certainly no fun to wake up with a headache. While sleeping on your stomach, it also causes your back to arch, putting pressure on the joints, discs and nerves which can cause muscle spams, sciatica, and back pain. Here’s another way to think about it: when you’re working out at the health club, how would your legs feel if you did leg presses for over an hour? Would you be able to walk home or to your car? It would be very difficult after stressing them so much. It’s the same with your neck. You’re doing something similar when you sleep on your stomach and turn your neck to the side for hours at a time. Now that doesn’t mean sleep on your stomach and put your head straight down into the pillow! You’ll suffocate! So what’s the alternative? Sleep on your back or side instead. When sleeping on your back, lie flat with a pillow under your head and neck and a pillow under your knees. Do not ever sleep with more than one pillow under your head. Your neck should not be pushed up so that your chin moves down toward your chest. A pillow should support your neck according to its natural S-shaped curve, allowing your head to rest in a neutral position. When you sleep on your side, support your head and neck with pillows in such a way so your spine will remain in a straight line. Your legs should be at a 35 to 45 degree angle and not drawn up in a knot or in the fetal position. You may feel more comfortable with a pillow between your knees to keep your pelvis from being tilted. The type of pillow you use at night on Sunday can make a big difference in how good you will feel on Monday. Do not use a regular foam pillow. A shaped cervical pillow or a feather pillow is best because the curve of the pillow supports your neck. In our office I highly recommend a water based pillow called Chiroflow. When your neck is supported, then all the muscles, tendons and joints can relax. As they’re relaxing, the blood sends in healing, rejuvenative and restorative nutrients. You wake up refreshed. It’s a bad habit to lie down on the couch, especially with your head propped up on the armrest. Propping up your head results in a cervical curve angle that stresses out the joints and the muscles of your neck. Every time you engage in this type of activity, you are willingly creating stress in your neck. Decide that your body wants to be loved and cared for, and never engage in this activity again. Decide that your body wants to be loved also if you read in bed. If you prop yourself up on your elbows or lie flat to read, this movement stresses out your shoulder joints and puts undue stress on your neck muscles and joints as well. Don’t do it! The best way to sleep is on your back. When it’s time to rest or sleep, sleep on your back or on your side on a firm bed and don’t settle for anything else. Make these changes and get your sleep score down to 0. One month of sleeping with a score of 0 will improve your health dramatically. Now you are ready to sleep better and start living a healthier and happier life. Make sure you look out for the rest of the series of blog posts which will help you live a healthier lifestyle without drugs and surgery. If you are looking for a chiropractor in Freehold, or the surrounding towns of Marlboro, Manalapan, Howell, Colts Neck, Jackson, Morganville or Millstone New Jersey, or other neighboring towns of Monmouth County, call our office: Hometown Family Wellness Center at 732-780-0044 for a complimentary consultation.